"SSTV" redirects here. For the South Sudanese state television channel, see South Sudan Television. SSTV transmissions often include station call signs, RST reception reports, and radio amateur jargon. The concept of SSTV was introduced by Copthorne Macdonald in 1957–58. He developed the first SSTV system using an electrostatic monitor and a vidicon tube. It was deemed sufficient to use 120 lines and about 120 pixels per line to transmit a black-and-white still picture within a 3 kHz phone channel. First live tests were performed on the 11 Meter ham band – which was later given to the CB service in the US. In the 1970s, two forms of paper printout receivers were invented by hams. SSTV was used to transmit images of the far side of the Moon from Luna 3. The first space television system was called Seliger-Tral-D and was used aboard Vostok. Vostok was based on an earlier videophone project which used two cameras, with persistent LI-23 iconoscope tubes. Its output was 10 frames per second at 100 lines per frame video signal. The Seliger system was tested during the 1960 launches of the Vostok capsule, including Sputnik 5, containing the space dogs Belka and Strelka, whose images are often mistaken for the dog Laika and the 1961 flight of Yuri Gagarin, the first man in space on Vostok 1. Vostok 2 and thereafter used an improved 400-line television system referred to as Topaz. A second generation system (Krechet, incorporating docking views, overlay of docking data, etc.) was introduced after 1975. A similar concept, also named SSTV, was used on Faith 7 as well as on the early years of the NASA Apollo program. The Faith 7 camera transmitted one frame every two seconds, with a resolution of 320 lines. The Apollo TV cameras used SSTV to transmit images from inside Apollo 7, Apollo 8, and Apollo 9, as well as the Apollo 11 Lunar Module television from the Moon. 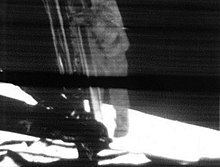 NASA had taken all the original tapes and erased them for use on subsequent missions; however, the Apollo 11 Tape Search and Restoration Team formed in 2003 tracked down the highest quality footage among the converted recordings of the first broadcast, pieced together the best footage, then contracted a specialist film restoration company to enhance the degraded black-and-white film and convert it into digital format for archival records. Commercial systems started appearing in the United States in 1970, after the FCC had legalized the use of SSTV for advanced level amateur radio operators in 1968. SSTV originally required quite a bit of specialized equipment. Usually there was a scanner or camera, a modem to create and receive the characteristic audio howl, and a cathode ray tube from a surplus radar set. The special cathode ray tube would have "long persistence" phosphors that would keep a picture visible for about ten seconds. The modem would generate audio tones between 1200 and 2300 Hz from picture signals, and picture signals from received audio tones. The audio would be attached to a radio receiver and transmitter. A modern system, having gained ground since the early 1990s, uses a personal computer and special software in place of much of the custom equipment. The sound card of a PC, with special processing software, acts as a modem. The computer screen provides the output. A small digital camera or digital photos provide the input. 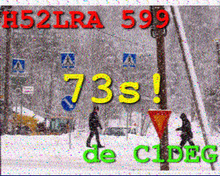 Like the similar radiofax mode, SSTV is an analog signal. SSTV uses frequency modulation, in which every different value of brightness in the image gets a different audio frequency. In other words, the signal frequency shifts up or down to designate brighter or darker pixels, respectively. Color is achieved by sending the brightness of each color component (usually red, green and blue) separately. This signal can be fed into an SSB transmitter, which in part modulates the carrier signal. A transmission consists of horizontal lines, scanned from left to right. The color components are sent separately one line after another. The color encoding and order of transmission can vary between modes. Most modes use an RGB color model; some modes are black-and-white, with only one channel being sent; other modes use a YC color model, which consists of luminance (Y) and chrominance (R–Y and B–Y). The modulating frequency changes between 1500 and 2300 Hz, corresponding to the intensity (brightness) of the color component. The modulation is analog, so even though the horizontal resolution is often defined as 256 or 320 pixels, they can be sampled using any rate. The image aspect ratio is conventionally 4:3. Lines usually end in a 1200 Hz horizontal synchronization pulse of 5 milliseconds (after all color components of the line have been sent); in some modes, the synchronization pulse lies in the middle of the line. Below is a table of some of the most common SSTV modes and their differences. These modes share many properties, such as synchronization and/or frequencies and grey/color level correspondence. Their main difference is the image quality, which is proportional to the time taken to transfer the image and in the case of the AVT modes, related to synchronous data transmission methods and noise resistance conferred by the use of interlace. ¹ Martin and Scottie modes actually send 256 scanlines, but the first 16 are usually grayscale. The mode family called AVT (for Amiga Video Transceiver) was originally designed by Ben Blish-Williams (N4EJI, then AA7AS) for a custom modem attached to an Amiga computer, which was eventually marketed by AEA corporation. The Scottie and Martin modes were originally implemented as ROM enhancements for the Robot corporation SSTV unit. The exact line timings for the Martin M1 mode are given in this reference. The Robot SSTV modes were designed by Robot corporation for their own SSTV unit. All four sets of SSTV modes are now available in various PC-resident SSTV systems and no longer depend upon the original hardware. AVT is an abbreviation of "Amiga Video Transceiver", software and hardware modem originally developed by "Black Belt Systems" (USA) around 1990 for the Amiga home computer popular all over the world before the IBM PC family gained sufficient audio quality with the help of special sound cards. These AVT modes differ radically from the other modes mentioned above, in that they are synchronous, that is, they have no per-line horizontal synchronization pulse but instead use the standard VIS vertical signal to identify the mode, followed by a frame-leading digital pulse train which pre-aligns the frame timing by counting first one way and then the other, allowing the pulse train to be locked in time at any single point out of 32 where it can be resolved or demodulated successfully, after which they send the actual image data, in a fully synchronous and typically interlaced mode. Interlace, no dependence upon sync, and interline reconstruction gives the AVT modes a better noise resistance than any of the other SSTV modes. Full frame images can be reconstructed with reduced resolution even if as much as 1/2 of the received signal was lost in a solid block of interference or fade because of the interlace feature. For instance, first the odd lines are sent, then the even lines. If a block of odd lines are lost, the even lines remain, and a reasonable reconstruction of the odd lines can be created by a simple vertical interpolation, resulting in a full frame of lines where the even lines are unaffected, the good odd lines are present, and the bad odd lines have been replaced with an interpolation. This is a significant visual improvement over losing a non-recoverable contiguous block of lines in a non-interlaced transmission mode. Interlace is an optional mode variation, however without it, much of the noise resistance is sacrificed, although the synchronous character of the transmission ensures that intermittent signal loss does not cause loss of the entire image. The AVT modes are mainly used in Japan and the United States. There is a full set of them in terms of black and white, color, and scan line counts of 128 and 256. Color bars and greyscale bars may be optionally overlaid top and/or bottom, but the full frame is available for image data unless the operator chooses otherwise. For receiving systems where timing was not aligned with the incoming image's timing, the AVT system provided for post-receive re-timing and alignment. The video game Portal, in an internet update of the program files three years after its original release, provided in-game radio objects, whose sound effects became part of an alternate reality game-style analysis by fans of the game hinting at a sequel of the game – some sounds were of Morse code strings that implied the restarting of a computer system, while others could be decoded as SSTV images from a grainy video. These images included further hints of a BBS phone number that when accessed, provided a large number of ASCII art-based images relating to the game and its potential sequel. The sequel, Portal 2, was later confirmed. In the aforementioned sequel, Portal 2, more SSTV images are broadcast in Rattman dens. When decoded, these images are pictures concerning elements of the game, such as the Weighted Companion Cube on the moon, and slides with bullet points on how the alternate reality game was done and what the outcome was, such as how long it took the combined internet to solve the puzzle. In another video game, Kerbal Space Program, there is a small hill in the southern hemisphere of a planet called 'Duna', which transmits a monochrome SSTV image of four astronauts standing next to what is either the Lunar Lander from the Apollo missions, or an unfinished pyramid. Above them is the game's logo and three circles. It only emits the sound if an object touches the peak of the hill. Caparezza, an Italian songwriter, inserted an image on the ghost track of his album Prisoner 709. Glidden, Ramon (September 1997). "Getting Started With Slow Scan Television." QST. Accessed on April 28, 2005. "Slow scan definition." On-line Medical Dictionary. Accessed on April 28, 2005. Turner, Jeremy (December 2003). "07: Interview With Tav Falco About Early Telematic Art at Televista in Memphis, New Center for Art Activities in New York and Open Space Gallery in Victoria, Canada." Outer Space: The Past, Present and Future of Telematic Art. Accessed on April 28, 2005. Sarkissian, John. Television from the Moon. The Parkes Observatory's Support of the Apollo 11 Mission. Latest Update: 21 October 2005. ^ Miller, Don. "SSTV history". Retrieved May 9, 2006. ^ Andrew Letten (2010-10-26). "'Lost' Apollo 11 Moonwalk tapes restored". Cosmos Online. Archived from the original on July 20, 2014. Retrieved 4 November 2010. SYDNEY: After a three-year search for the lost Apollo 11 tapes and an exhaustive six-year restoration project, digitally remastered footage of the historic Moonwalk is almost ready to be broadcast. ^ a b Langner, John. "SSTV Transmission Modes". Archived from the original on February 16, 2003. Retrieved May 8, 2006. ^ Cordesses, L. and R (F2DC) (2003). ""Some Thoughts on "Real-Time" SSTV Processing."". QEX. Retrieved September 2, 2008. ^ Leahy, Brian (2010-03-01). "Portal Patch Adds Morse Code, Achievement - Portal 2 Speculation Begins". Shacknews. Retrieved 2010-03-02. ^ Mastrapa, Gus (2010-03-02). "Geeky Clues Suggest Portal Sequel Is Coming". Wired. Retrieved 2010-03-02. ^ Gaskill, Jake (2010-03-03). "Rumor: Valve To Make Portal 2 Announcement During GDC 2010". X-Play. Retrieved 2010-03-03. Wikimedia Commons has media related to Slow scan television.